"A BIT OF GOOD NEWS"
1. 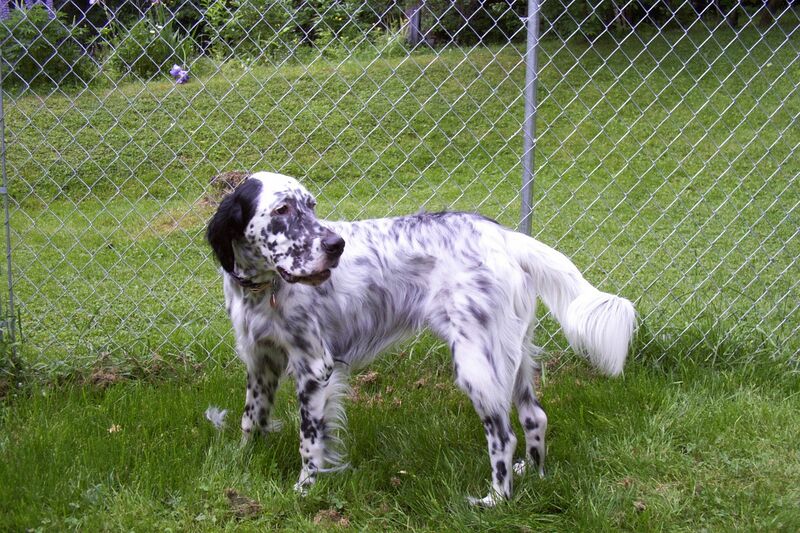 The new dog must be an English Setter, as she has one visit her at work and fell in love with it. 2. I must put in a dog door, as it seems that all our dogs have asked her for the door. 3. I must place an outdoor kennel outside the said dog door. So the said dog will have a place to go. 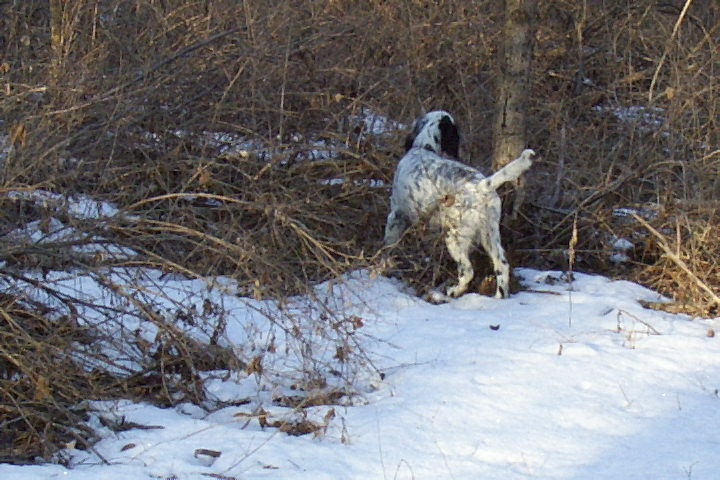 I’ve heard great things about English Setters for grouse hunting so we started calling around and found a breeder we liked. Dan at Bayview registered Setters gave us some great references. So we have a Setter on the way. It will be a male and its name will be Scout. So I’ll be telling you about him and his training in the next few months. By the way within three weeks of my wife giving me the stipulations Gunner was enjoying the freedom of his new door and outdoor kennel. "WELL, I DID SAY WE WANTED TWO DOGS." With the loss of Gunner it left us with the big question do we still want two dogs. 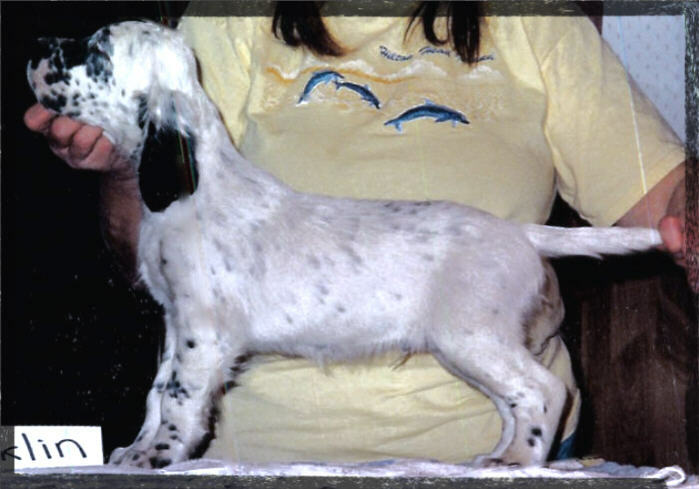 The answer was yes so we started looking on the net to see if there might be any breeders of English Setters out there that had pups available. We got in touch with Suzanne Sliney of Andover Kennel. 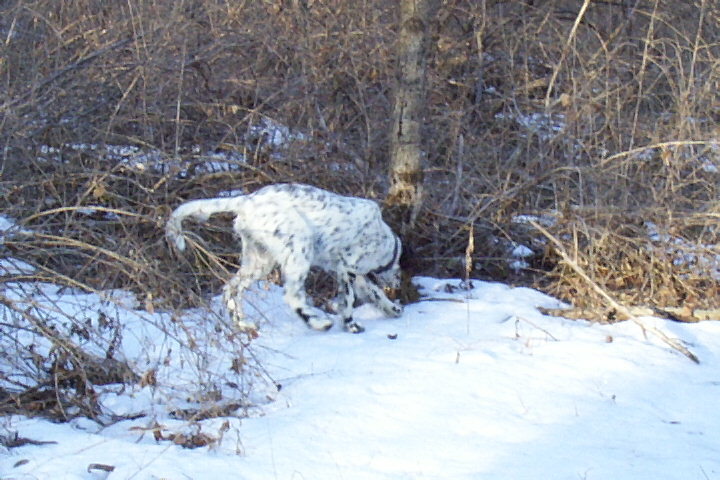 She knew of a pup from a litter that she had provided stud service for that was still available. The pup was 15 week old and staying at the home of the dam. I got in touch with Doug Wylie of Ramblewood Kennel and he told me that the pup was available and staying with him in his home. 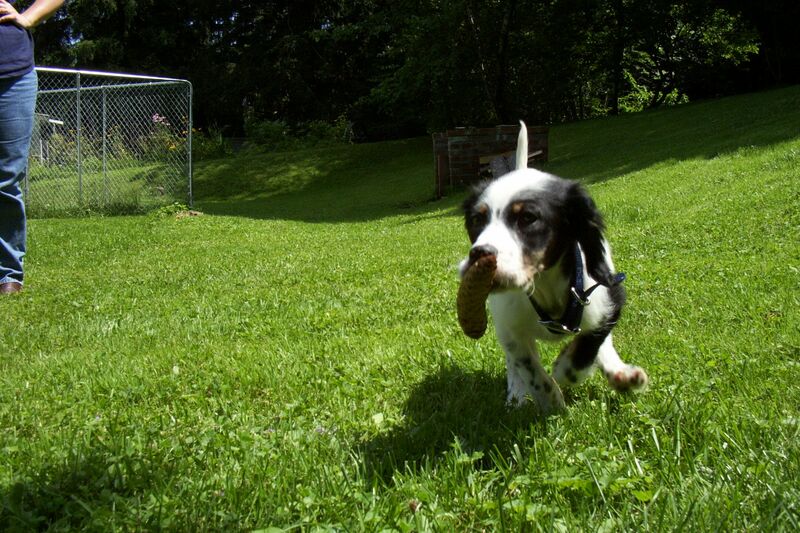 At this point I asked for and received a picture of the pup from Suzanne, he was what I have in my mind as the perfect setter pup. Before calling Doug back I was thinking of what to name him and was planning on Sergeant. I called Doug back to let him know that we would be down to pick up the pup, as we talked I asked him if he had been calling the pup by any name? He had and the name was Major. The pup at this point was field promoted to the rank of Major. WOW! what a great dog Major is. He adjusted to his new home like it was nothing new and He and I had a great time in the woods his first full day with us, one flush out of a pine. There is a lot of ice on the ground in our area so I was greatful for that one flush. Major looked up at it, as if he knew that that was the prize! We have had Major in our home for two weeks and I can not get over what a good dog he is. He wet once the first day and that was it. Major is very responsive to training, he come on command, retrieves a dummy on command and sits. 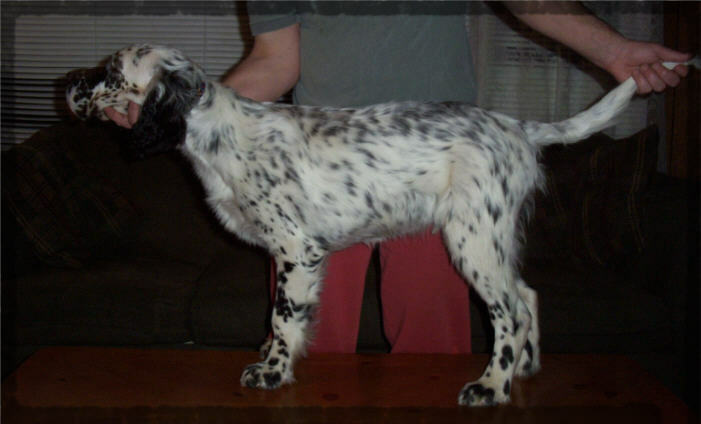 That's only the first two week I'm very excited about the possibilities of this English Setter pup. 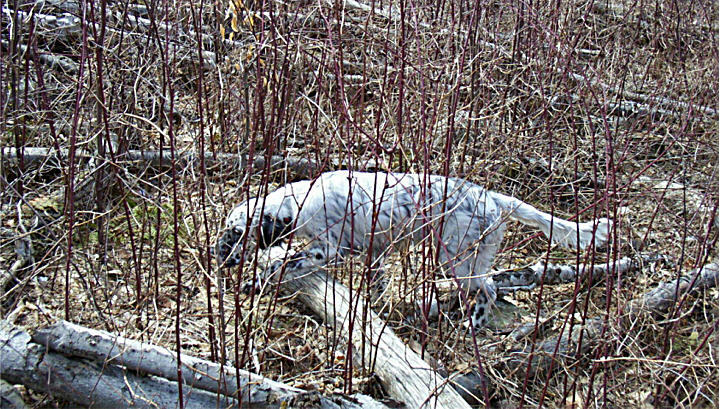 "The Second dog is here"
I am so excited to introduce this new pup to you and I hope that I'll have some time to share some more of his training then I did so far with Major, Did I mention that Major is doing a great job finding and pointing Woodcock. Back to the new pup I said the name would be Scout however it up in the air as of now. Two days later and the name will be Scout. Dan at Bayveiw the kennel where Scout came from said his dogs would come to a lip whistle and I will give you my word, that if I whistle he is at my feet in a few seconds. By the way, I don't know who is more afraid of each other, Major or Scout. The first night they sleep side by side so I think they will get along just fine.